Herman Bavinck’s four-volume Reformed Dogmatics is one of the most important theological works of the twentieth century. The recently completed English translation has received wide acclaim. Now John Bolt, one of the world’s leading experts on Bavinck and editor of Bavinck’s four-volume set, has abridged the work in one volume, offering students, pastors, and lay readers an accessible summary of Bavinck’s masterwork. 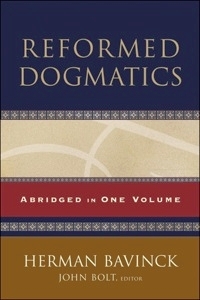 This Reformed Dogmatics: Abridged in One Volume presents the core of Bavinck’s thought and offers explanatory material, making available to a wider audience some of the finest Dutch Reformed theology ever written. About the Author: Herman Bavinck (1854-1921) succeeded Abraham Kuyper as professor of systematic theology at the Free University in Amsterdam in 1902. John Bolt (PhD, University of St. Michael’s College) is professor of systematic theology at Calvin Theological Seminary in Grand Rapids, Michigan. The late John Vriend translated many classic theological works.